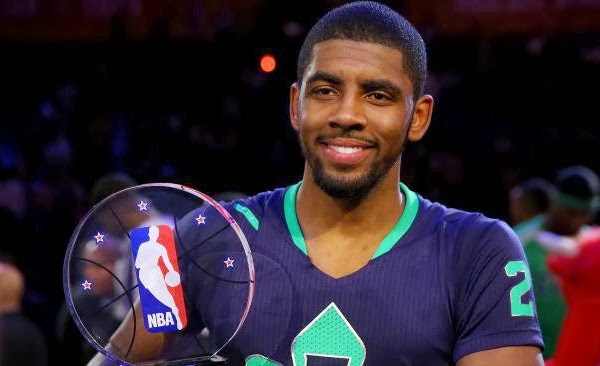 The Eastern Conference outgunned the West 163-155 in the 63rd edition of the NBA All-Star Game, with Cleveland Cavaliers point guard Kyrie Irving picking up Most Valuable Player honors. The East snapped a three-game losing skid and pushed its overall lead over the West to 37-26 thanks to the strong play of the 21-year-old Irving, who notched a double-double with 31 points and 14 assists. The Australian-American, who was making his second All-Star appearance, also grabbed five rebounds Sunday night at the Smoothie King Center in New Orleans. New York Knicks forward Carmelo Anthony also had a big night for the East, scoring 30 points on 10-of-18 shooting from the field. Most of those attempts were from behind the 3-point line, where Anthony was 8 of 13. Miami Heat star LeBron James, a four-time league MVP, scored 22 points and also had seven assists and seven rebounds. The West was led by Oklahoma City Thunder standout Kevin Durant and Los Angeles Clippers star and dunker extraordinaire Blake Griffin, who scored 38 points apiece. In a game in which defense - as usual - was non-existent, the West led 89-76 at halftime. The East had cut the lead to three by the end of the third quarter, and then scored the final 10 points of the game as the Western Conference players went cold with their shooting late in the fourth quarter. "It's a great honor," Irving said after receiving his MVP trophy from new NBA Commissioner Adam Silver. "Everyone out here is an MVP." The contest, played in front of 14,727 spectators, was the second NBA All-Star Game to be played in New Orleans.